The Review & Evaluation Program (Buildable Lands) is a crucial piece of local and regional land use planning. 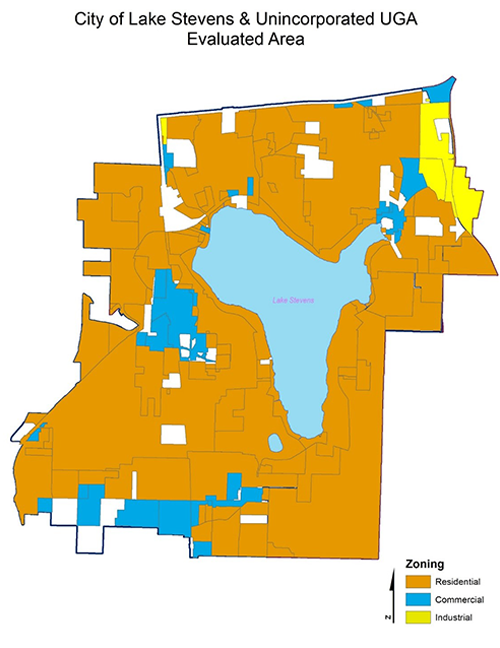 The Lake Stevens City Council recognized the importance of conducting an analysis of Buildable Lands, which takes into account new elements of state law and updated guidance from the Department of Commerce regarding growth pressures and Lake Stevens land use change. Planning staff at LDC, Inc., in coordination with Lake Stevens City staff, produced a geographic information system (GIS) analysis and an accompanying report to summarize and synthesize both population and employment growth from 2015 through 2018 as well as remaining land capacity within the UGA. LDC, Inc. found that the City of Lake Stevens and the unincorporated UGA together accommodated approximately 70 percent of the adopted 2035 growth target between 2015 and the end of 2018. Additionally, sufficient buildable land was identified in the city and UGA, which established a capacity surplus beyond the 2035 target. LDC, Inc. worked closely with the City of Lake Stevens to understand their specific needs and tailored the analysis and methodology to consistently match those implemented at City and County levels.